Readers located in the Western United States and East Asia should mark their calendars for this Sunday’s (May 20, 2012) solar eclipse. To some degree, the eclipse should be observable from Texas to Thailand, with certain locales observing an annular eclipse, while others will still get the treat of a partial eclipse. Photo of a 2005 annular eclipse, as seen from Spain. Photographed by Abel Pardo López and used under a Creative Commons license. Click image for source. 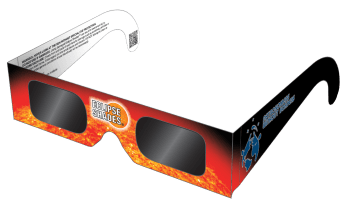 Unlike the case with a total eclipse, where the Moon is closer to Earth and covers the entire Sun (less its corona), do not look directly at an annular eclipse with your naked eyes! 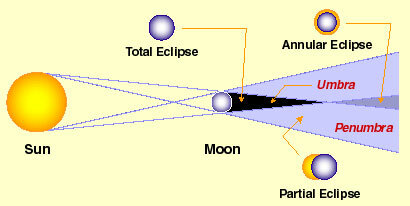 For those of us that will be outside the path of the annular eclipse, many will still be able to see a partial eclipse. Without going too deep into the geometry of an eclipse, be aware that there are basically three types of shadows produced during the event: the umbra, antumbra, and penumbra. The umbra is the darkest part of the Moon’s shadow, and when it falls upon the Earth it results in a total eclipse. From within the umbra, the Sun is completely blocked out by the Moon. From the vantage point of an observer within the penumbra, the Sun is only partially blocked by the Moon, resulting in a partial eclipse. Within the antumbra, an observer will see the Moon pass completely between them and the Sun, however its apparent size compared to the Sun will be small enough that it will not completely block out the Sun; an annular eclipse. If you live near Kenai, Alaska (like me) there are your details. Take note that the times are in Coordinated Universal Time (UTC), so you’ll want to adjust accordingly based on your time zone. In my local case the eclipse will begin at around 3:15pm local time (UTC – 9 [AK Time] + 1 [Daylight Savings Time]) and continue for nearly three hours, as the Moon slowly moves across the face of the Sun. For other locations, you’ll find this tool very easy to use. I’m glad you asked! By all means, do NOT look at this eclipse with your naked eyes. You will damage them. The visual part of the electromagnetic spectrum is far too beautiful to go damaging your instruments to see it (your eyes!). Fortunately, there are a few simple tools you can use to view it. If you choose to purchase some (there may not be enough time to receive them before Sunday, but there will be plenty of future opportunities to use them as well), I recommend purchasing through a company associated with Astronomers Without Borders, where proceeds will go to benefit others interested in astronomy. Make sure any you use are clearly labeled that they’re safe to view the Sun through. An alternative to these glasses is to use Number 14 Welders’ Glass, available at welding supply shops. You can also use a pair of binoculars or a telescope as follows, but make sure that nobody (small children, non-bright adults, pets) looks at the Sun through the eyepieces; it could very well be the last thing they see. 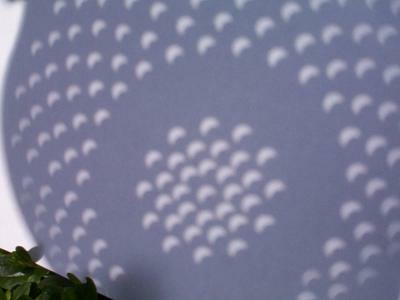 To use binoculars or a telescope, you want to project the image onto a piece of shaded white paper. Just align the Sun with the objective lens (not the eyepiece lens) and let the light pass through and onto the piece of paper. An image of the Sun will appear on the paper and, while bright, will be safe to look at. And finally, if you do not have solar shield glasses, Number 14 Welders’ Glass, binoculars, or a telescope (again, projected onto paper! ), you still have another option. You can use a colander, a piece of aluminium foil with a hole punched in it, or even with the aid of a leafy tree. Obviously, if you took a colander outside on a sunny day, let the sunlight shine through it, and reflect onto the ground, you would see the circular dots of light where it was allowed to pass through the holes in the colander, and shade where the solid part of the colander blocked it. If you happen to do this when the Sun doesn’t appear as a solid circular light source (an eclipse), or if something is passing in front of it (a transit), the light in those dots on the ground will show it as well. This same effect will work if you poke some holes in aluminium foil, a pizza box, or whatever you might have available. Luckily, you’ll have a bit of time during the eclipse to experiment and see what works best. So that about covers it. If you have any questions, if I’ve missed anything, or if you believe there is a mistake in my explanations, please leave a comment. I hope you’ll take the opportunity to enjoy this celestial treat and I hope you find people to share the experience with you as well.